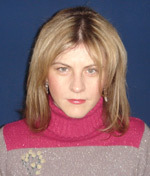 Dr. Dragana Jugović, BS Phys.Chem. She was born on February 1st 1973 in Belgrade, Serbia. She graduated from the Faculty of Physical Chemistry in Belgrade in 2002. She completed her M.Sc. studies at the same Faculty in 2004 with thesis „Characterization of LiMn 2-xMxO4 (M=Mn, Cr, Zn) cathode materials obtained through ultrasonic spray pyrolysis“. She was elected a Research Assistant in 2005. She submitted her Ph.D. thesis at the Faculty of Physical Chemistry in Belgrade. In July 2008 she defended doctoral thesis entitled "Synthesis and Characterization of Oxide Cathode Materials for Lithium Energy Sources" at the Faculty of Physical Chemistry. She was elected a Research Associate in 2009 and a Senior Research Associate in 2014. Fields of interest: cathode materials, fine particles, aerosol synthesis, crystallography. The paper Jugovic, D. & Uskokovic, D. 2009, "A review of recent developments in the synthesis procedures of LiFePO4 powders, Journal of Power Sources", vol. 180, no. 2, pp. 538-544, doi:10.1016/j.jpowsour.2009.01.074 was the most downloaded article from this journal between April and September 2009. During the 2009/10 Academic Year (October 2009 – September 2010) it was the eighth most downloaded paper from this Journal. D. Jugović, N. Cvjetićanin, M. Mitrić, S. Mentus, and D. Uskoković, “Comparison between different LiFePO4 synthesis routes”, Materials Science Forum 555 (2007) 225-230. D. Jugović, M. Mitrić, M. Kuzmanović, N. Cvjetićanin, S. Škapin, B. Cekić, V. Ivanovski and D. Uskoković, Preparation of LiFePO4/C composites by co-precipitation in molten stearic acid, Journal of Power Sources 196 (2011) 4613–4618, doi:10.1016/j.jpowsour.2011.01.072.